* 46L Capacity for placing 100-110pcs towels. * Sterilization then it can keep the item so safe for using. * Easy to use and to operate. * It is professional for beauty salons, spas,massage therapists and many other palces. * No need to install drivers, plug and play. 1. After starting the cabinet and when it hasn't reached to the given level of the temperature,please don't try to open the cabinet's door and so as not to affect the heat rising result. 2. Please use a cramp to fetch the towels due to the high temperature inside the cabinet,and never try to fetch towels directly with hands in order to avoid being scalded. 3. When to clean the cabinet,please make sure to pull off the power plug first. 4. Please to check often water deposit box and empty the deposit water timely. 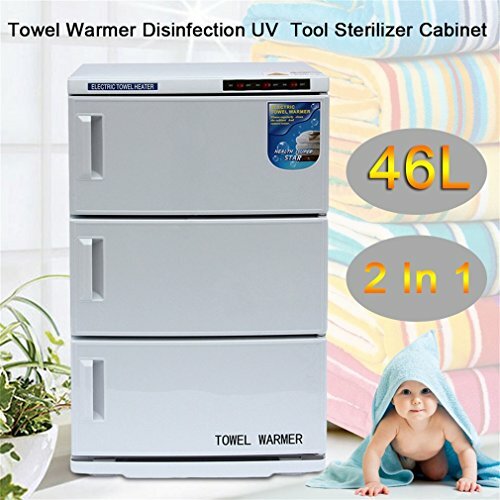 【2-in-1 Design】Sterilizes towels while storing and warming them for great comfort of your customers and clients. 【Faster to Get Your Hotter Towels】 Heats up faster and hotter than competitive models with 158°F towel temperature and features a quality strong and solid frame with fortified door hardware and seals, suitable for long term use. 【Multiple Occasion】It keeps towels warm all day long, perfect for beauty salons, spas, gyms, restaurants, massage therapists, tattoo shops and other uses; It can use for both commercial or home.